Counsilman-Hunsaker conducted a facility audit in March 2015 on the Koury Natatorium at University of North Carolina (UNC) in Chapel Hill. Conditions were evaluated and interviews were conducted with personnel who were familiar with the construction and operation of the facility. Field notes, meeting minutes, and photographs were utilized to prepare assessments, preliminary recommendations, and opinions to complete the scope of services. The audit included a review of deficiencies regarding current local health codes, federal laws, and industry standards; general commentary on support spaces, including equipment areas; specific commentary on any necessary repairs, replacement or restorations; and an opinion of probable construction cost for any modifications, replacements and/or additions required for the aquatic center. In response to the evaluations and findings from the audit, the team of Counsilman-Hunsaker and CRA Associates was directed to move forward with construction design services for the demolition and replacement of the pool filtration system for the 50-meter competition pool in the Koury Natatorium. 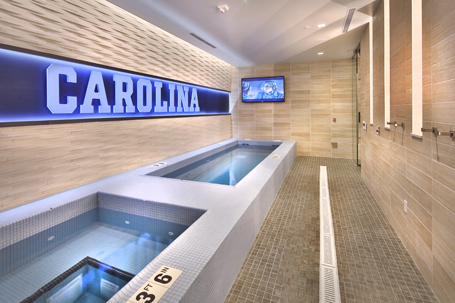 In addition to the renovation of the Koury Natatorium, Counsilman-Hunsaker was retained by the university to design spas for the UNC for the Basketball program. Complete in 2016, the project consists of a 75 sq. ft. in ground cold spa and a 35 sq. ft. hot spa of in concrete construction.